Emergency Personal Alarm set It definitely catch other PROMPT attention in SOS emergency situation and you can activate it easily with one hand. Feel safe carry this alarm around. Get it from Nuu You. 1. Pull out the bolt to activate the extremely LOUD. 2. Insert the bolt back to silence it. 3. Keep Press the mini oval shape button to turn on the LED light. 4. Release the mini oval shape button to turn off the LED light. 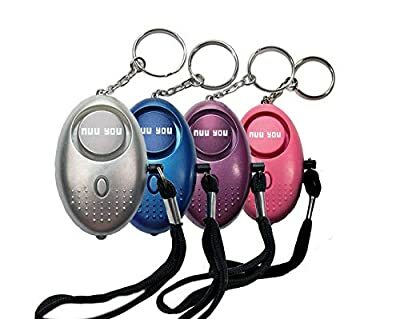 This self defense electronic device is necessary for elderly / kids /students/ womens / outdoor adventurer/ night workers to defense self in emergency, also is invaluable in situation anti theft?patrol?bullying at school, It is super LOUD. The sounds could last 50 minutes continuous piercing alarm. 140dB Personal alarm horn is enough to scare off an attacker or draw attention for people if they need prompt attention or help. How to Activate the Alarm: There is a lanyard attached to a bolt on the side of the alarm, pull the bolt out to activate the alarm, Insert the bolt and it will be ready for next for multiple use. Additional Flashlight Function: Includes a miniature LED Flashlight, activated by a separate on/off oval shape button, for a quick and illumination of a walking path, car door lock, or other low light situations. ?Safety Warning: 1.140 DB alarm is ultra loud, please do not put by your ears. 2. Including small parts, please keep it away from kids under 3 years old. 3. This alarm is not completely waterproof, please do not put it in the water and keep it in a dry condition as possible.